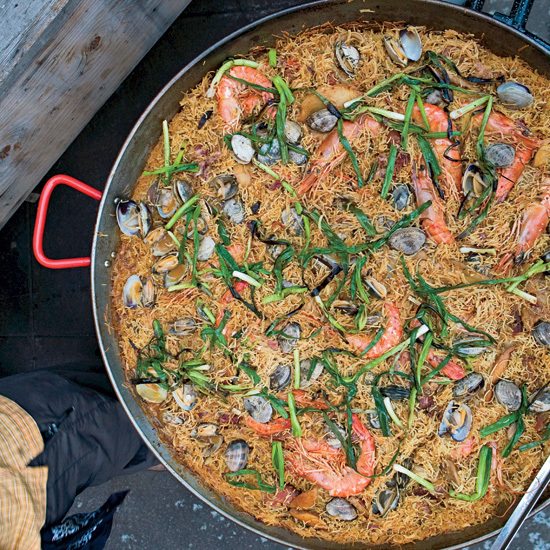 Take your taste buds on a trip with this collection of our favorite Spanish recipes. 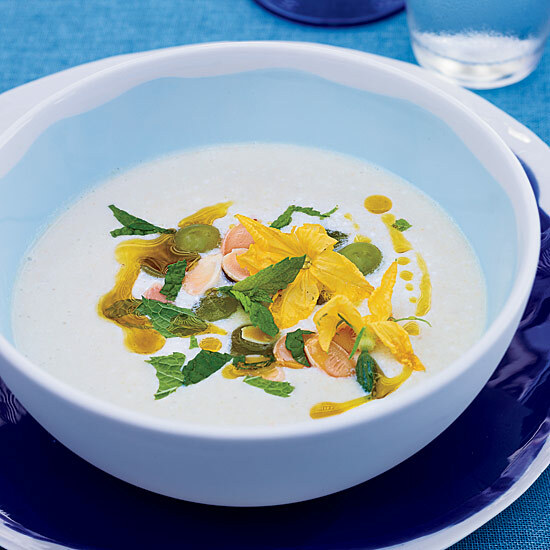 From poulet basquaise with currant couscous to a refreshing white gazpacho, these are the dishes you'll want to make right now. 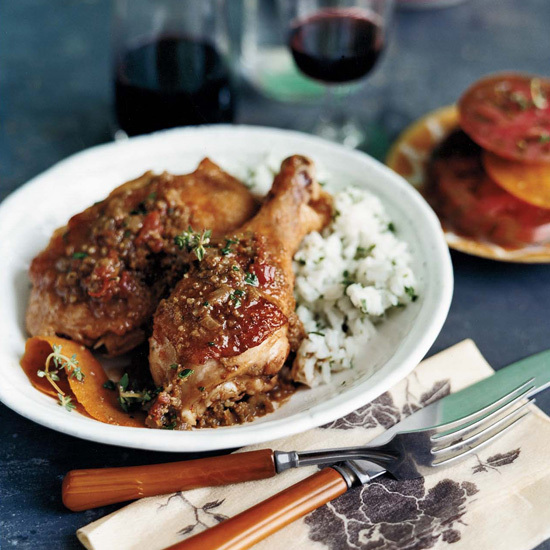 This excellent Basque-style chicken from Shawn Gawle, chef at Les Clos wine bar in San Francisco, also includes strips of poblano, plus a sauce enhanced with pimenton, the smoky Spanish paprika, and a splash of sherry vinegar. Mark Bright, Les Clos's owner, suggests a basic red Burgundy with it. This Catalan dish, made with chocolate and spices, is reminiscent of Mexican mole, says cookbook author Janet Mendel. "But without the spiciness of the chiles, it's much easier to pair with wine." 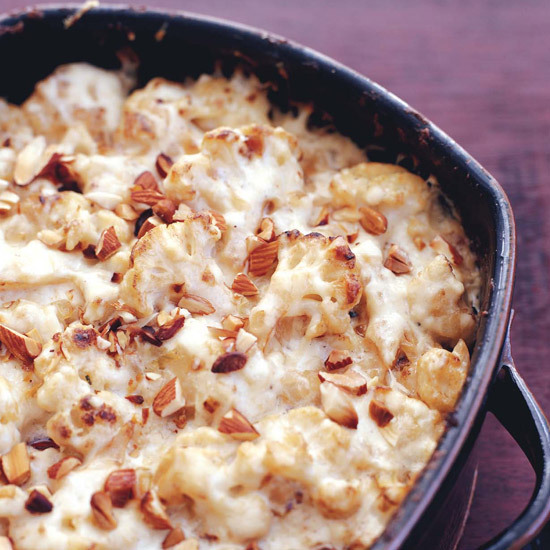 The sauce is thickened with picada, traditionally a blend of toasted nuts, herbs and garlic. 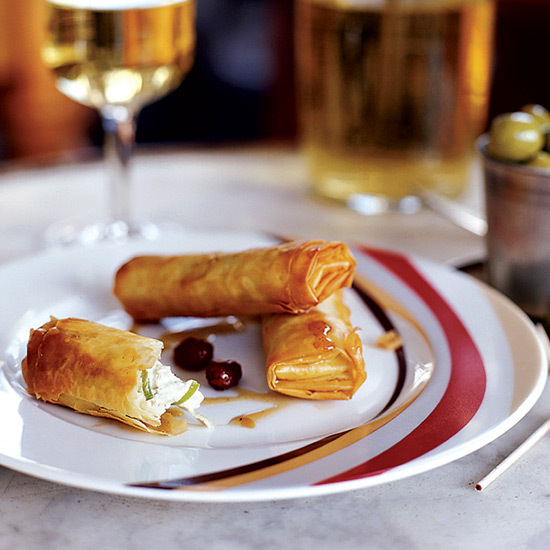 This timeless tapa from Spanish cookbook author Penelope Casas has everything going for it—it’s sweet, smoky and savory, all in one bite. 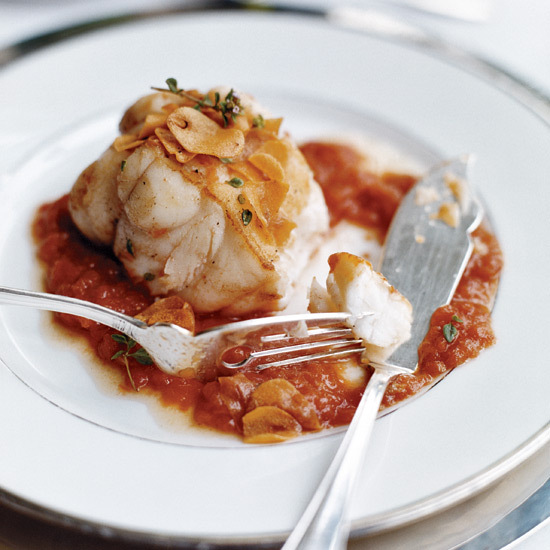 Romesco is a slightly smoky puree of roasted red peppers, garlic and almonds. 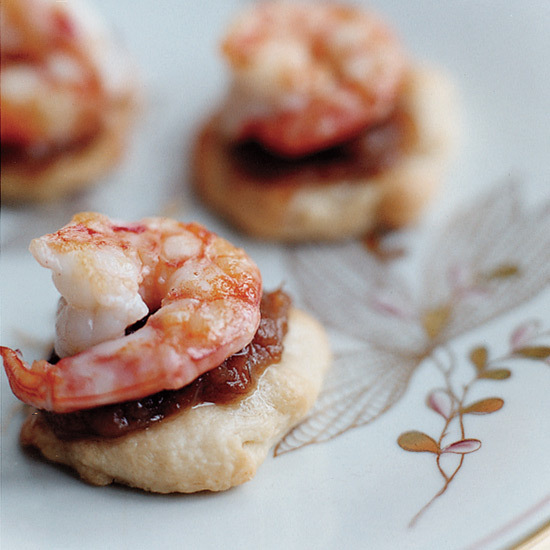 The versatile sauce is often served with fish or vegetables, but here it is spread on rounds of soft homemade flat bread and topped with sautéed shrimp. Tortilla española exists in almost every corner of Spain: as a tapa in fancy city restaurants; as a filling for bocadillos (sandwiches) at gas-station cafés; as a main course served on worn metal plates in home kitchens. This hearty paella is brimming with browned chicken, seared squid, spicy chorizo and briny shellfish. For a faster version, omit the sole and crabmeat. 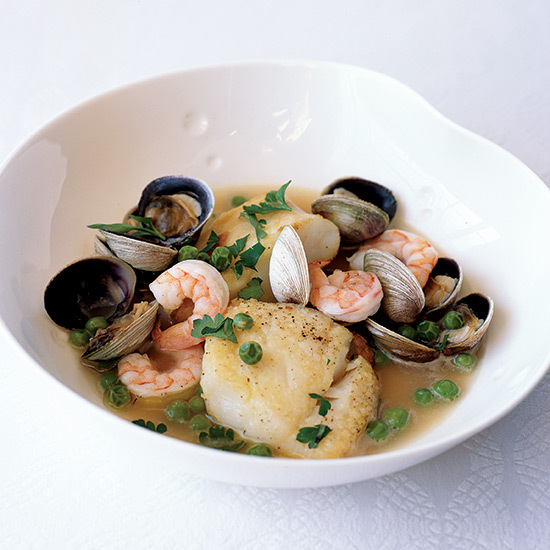 A fast and simple fish dish from from Spanish cookbook author Janet Mendel. 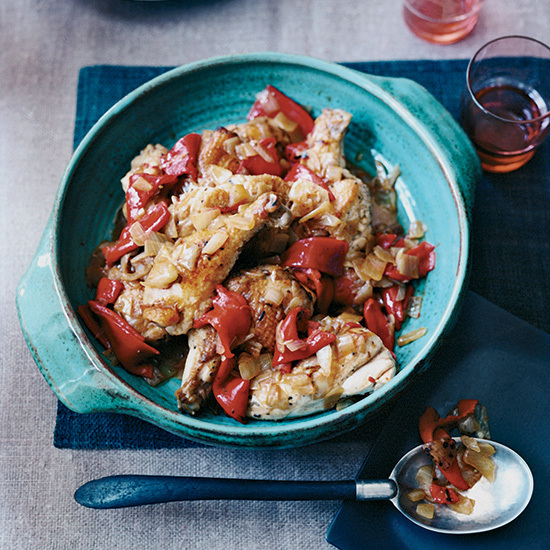 This luscious, rustic Spanish chicken dish is cooked in a rich but simple white wine and pepper sauce. Canned white asparagus from Navarra is so revered in Spain that it has its own D.O. (a protected denomination of origin). 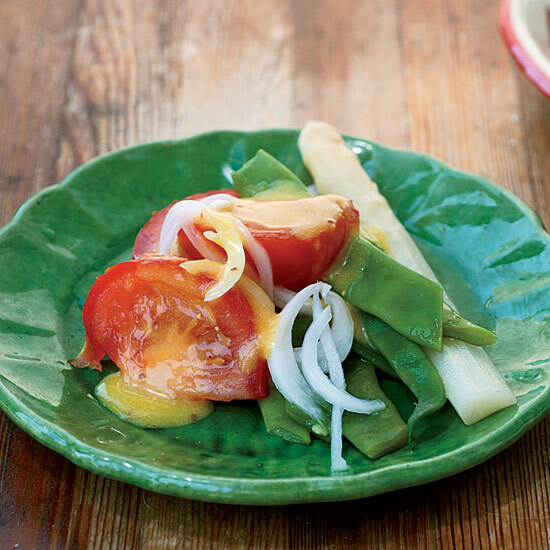 This simple, composed salad is a lovely way to showcase its buttery flavor. Ilan Hall's ingenious dish merges fideos—a Spanish classic made with toasted pasta that's cooked in stock—and Japanese grilled sticky rice cakes. 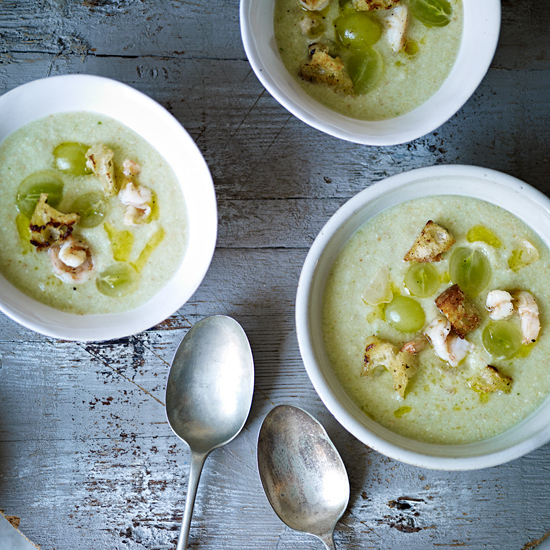 "This dish is almost a cliché in Navarra, but it's absolutely delicious," says Alex Raij. 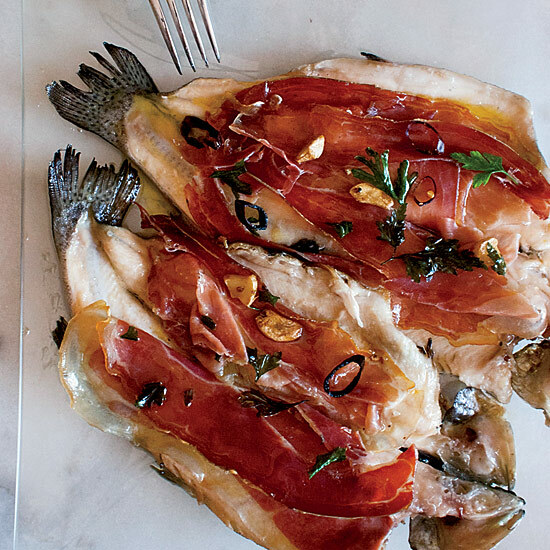 "The Spanish ham keeps the fish from drying out, basting it with its inimitable fat." This stew, like all those in Catalonia, starts with a sofrito, a thick sauce made with sautéed onions and tomatoes. 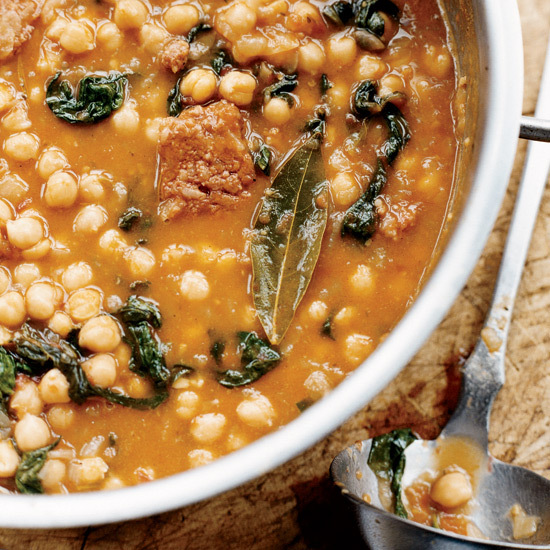 Once you get all the ingredients in the pot, there's not much to do besides enjoy the aroma wafting from this hearty, spicy, soupy stew as it slowly cooks. 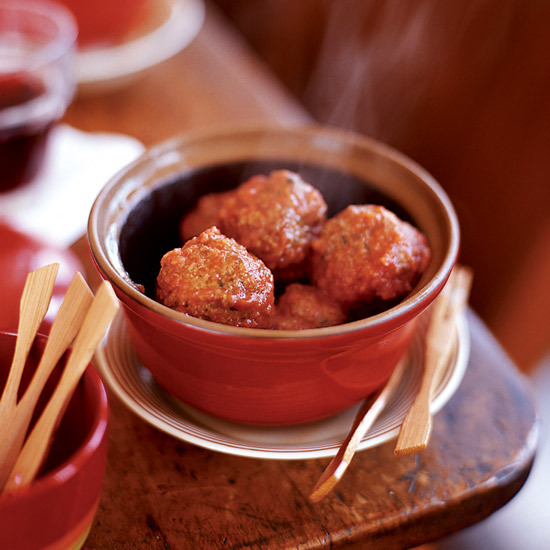 This standout tapa, Albóndigas de Cordero a la Hierbabuena, is made with the classic combination of lamb and mint. Fideos are thin, often toasted noodles that are used in a paella-like Spanish dish called fideuá. Chris Ainsworth cooks his fideos over the grill with a saffron-scented ham-hock broth and head-on prawns, but the recipe is also good with standard shrimp. These flaky cheese-and-leek-filled pastries are the world's best finger food. A garlicky red tomato sauce is the essence of Spain. Served over seared monkfish fillets it becomes a simple weeknight meal. 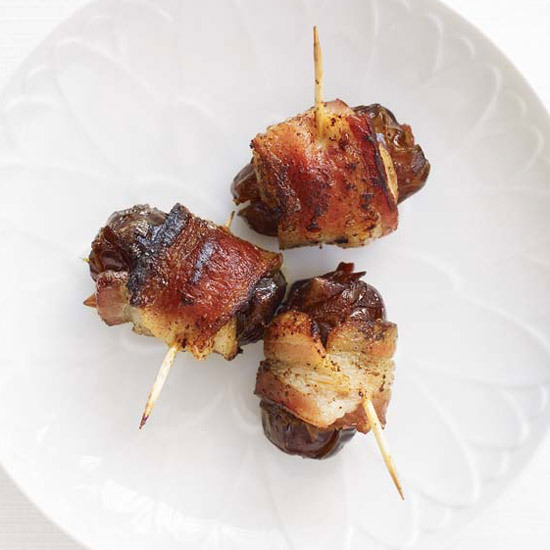 Pork and fruit is a classic pairing around the world, but this dish gets a particularly Catalan flavor from the combination of dried fruit and butifarra (a Catalan cured pork sausage) in the stuffing. 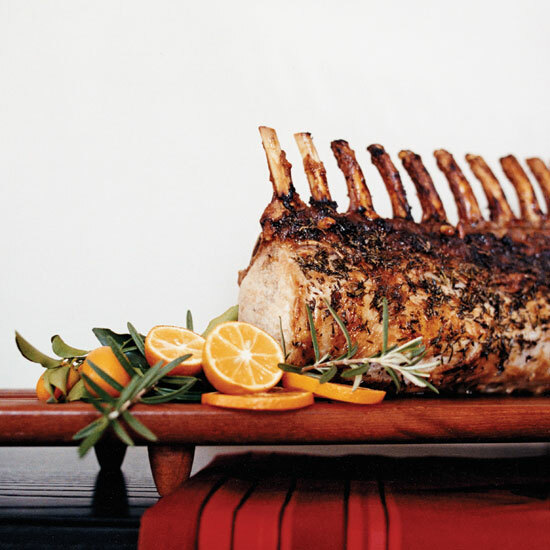 The stuffing cooks inside the roast, which gives it a deep, marvelously porky flavor. This outrageously rich sauce, flavored with salty, nutty Manchego, gets poured on sautéed cauliflower and baked until it's golden and bubbling. 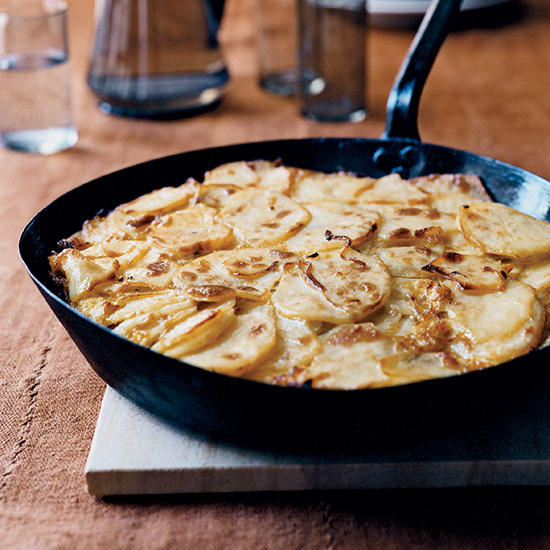 This dish is a brilliant combination of robust flavors. 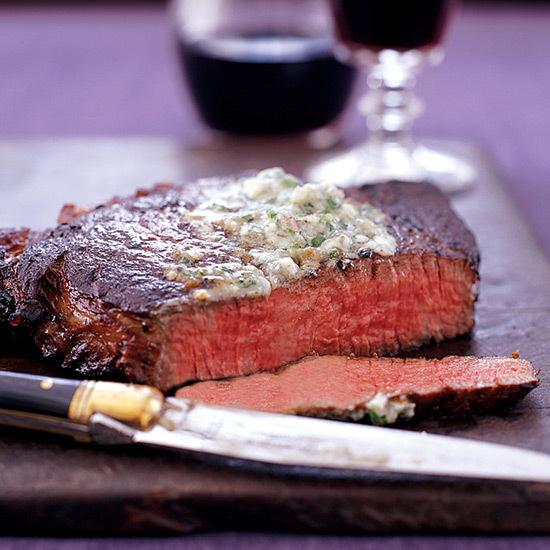 Tender rib eye gets flavored by the smoky garlic marinade as well as by a pungent blue-cheese butter that melts down the sides. Any creamy blue would be terrific here, but Valdeón, a maple leaf–wrapped cheese from Picos de Europa, adds complexity. 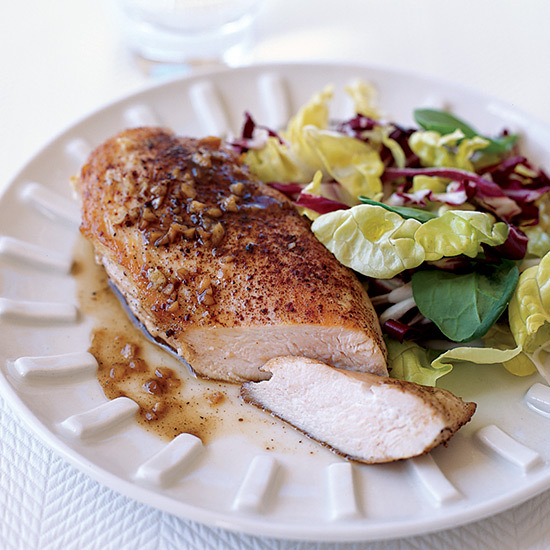 Aguardiente de anís, a clear, anise-flavored brandy, complements the cinnamon and other spices in this succulent chicken dish. Use dry aguardiente or substitute Pernod. 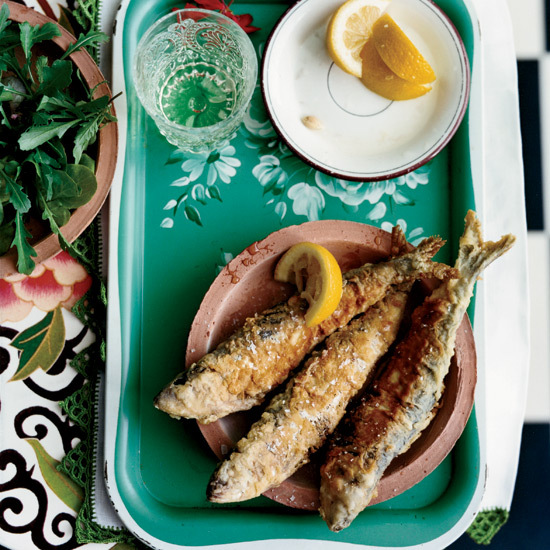 The traditional Galician preparation is to simply grill freshly caught sardines over hot coals. 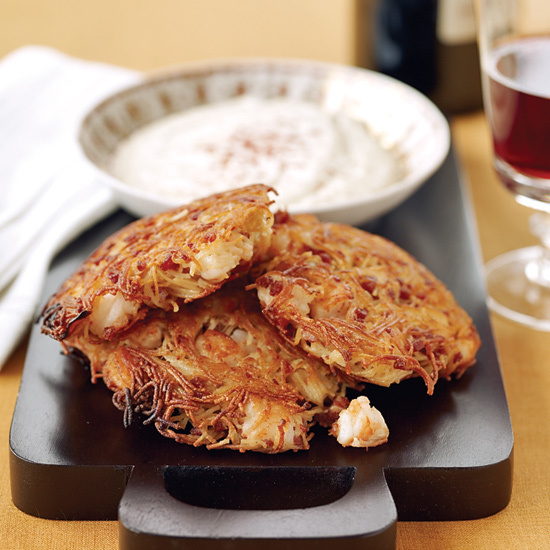 Instead, Spanish cookbook author Janet Mendel fills the tender fish with a sweet-salty ham-and-raisin stuffing and fries them to make a crunchy starter that loves a crisp Albariño. A different take on gazpacho, this time with cucumbers and shrimp instead of tomatoes and peppers.